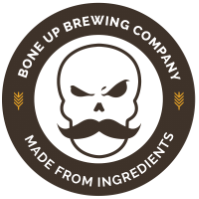 Stats: Summit - Bone Up Brewing Co.
Color: Bright orange with hints of red playing about the edges, not unlike an overripe tangerine. Food Pairing: A ham and cheese sandwich served on a fresh brioche with crisp romaine lettuce and a horseradish-forward mustard. Music Pairing (Jimbo's Choice): The Divider by Indian Handcrafts. Music Pairing (Jared's Choice): Cry of the Banshee by Brocas Helm. Best Occasion to Drink: Ideally, you'd drink this on a picnic in some sort of idyllic meadow, but since it's the middle of friggin' winter you should probably just drink the hell out of it at our block party. For our single-hop beers, we usually tend to focus on hops that are lesser known or (in our opinion) underappreciated. In this case, we went with a hop that's pretty well known in the brewing community. Specifically, it's known for being polarizing (some might even say it's divisive - not unlike the Great Crystal Malt Debacle of '92 that I just made up). When used properly, Summit can lend a delightful orangey fruitiness; when used improperly... well, I won't fill your head with fanciful notions, so let's just say it's less pleasant. But we set forth anyway and brewed a beer with this controversial* hop, and we're dang glad we did! It smells like a picnic and it delivers an all-around satisfying drinking experience. Cheers! * Here we're assuming you have a very broad definition of "controversy."